Immunogen: Synthetic peptide corresponding to aa 7-17 of GLP-1. Crossreactivity: Shows <0.2% cross-reactivity with GLP-1(1-37), GLP-1(9-36)amide, glucagon, human GIP and exendin-4. Cross-reacts approximately 1% with human GLP-2. Application Notes: Not recommended for use in sandwich ELISA. Scientific Background: Glucagon-like peptide 1 (7-36) amide (GLP-1 (7-36) amide) is the principal active form of GLP-1, the other being GLP-1 (7-37). 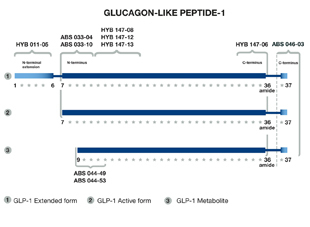 GLP-1 is a peptide hormone of the glucagon family, produced by the L cells of the intestinal mucosa from the same prohormone as glucagon. The active forms are potent stimulators of glucose-dependent insulin secretion. The sequence of GLP-1 is fully conserved in all mammalian species examined so far.